Survivor: One World finale in NYC. Pre-game Ep1: "She Annoys Me Greatly" Ep2: "Honey Badger" Ep3: "There's Gonna Be Hell to Pay"
Pairs of fans and favorites battle to take an inflatable ring back to their team flagpole. Bikal (favorites) wins flint and 20 lbs of beans. Pairs of contestants race up successive floors of a 4-story structure and toss down crates of sandbags. Final pair collects sandbags and tosses into six holes, raising a flag. 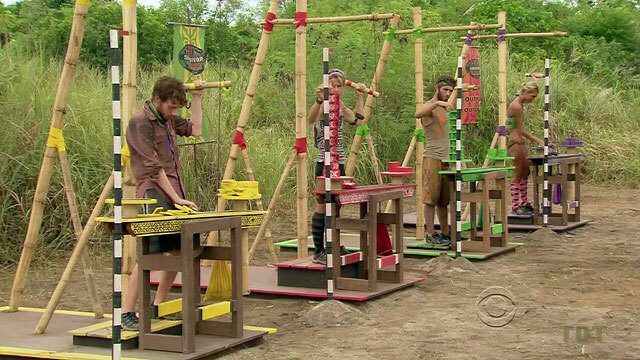 Reynold passes Malcolm on final part for a Gota win of immunity plus flint. Ep1 IC: "A Long Way To the Top" - Gota wins. 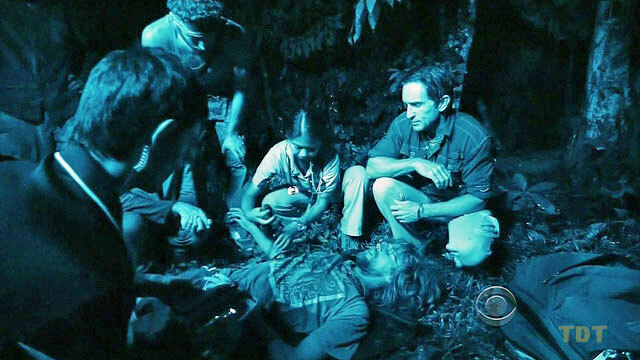 At some point during Episode 2, Reynold finds Gota's hidden immunity idol. 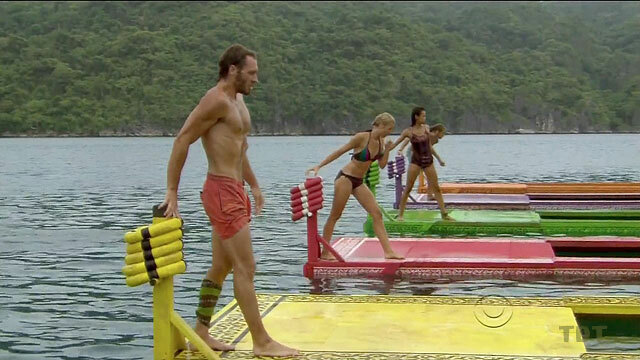 Trios of contestants are pulled out to a dock on a sled (by 3 tribemates). After diving to remove restraining sticks, they collect ring floats, and return to shore, where 3 more tribemates toss the 9 rings until they land on 3 target poles. 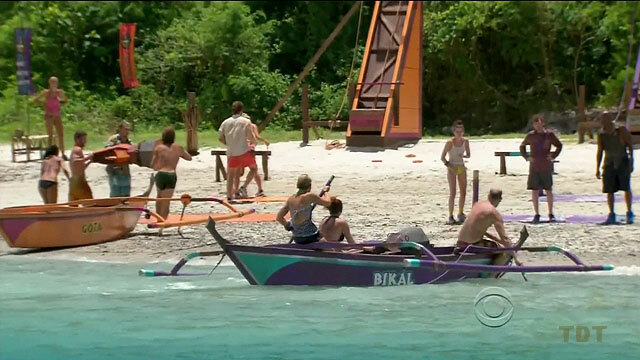 Bikal easily wins immunity and fishing gear. Ep2 RC/IC: "Plunge, Pull & Pop" - Bikal wins. Malcolm and Corinne find Bikal's idol. Ep3: "There's Gonna Be Hell to Pay" Ep4: "Kill or Be Killed" Ep5: "Persona Non Grata"
Tribes swim out to a cage and climb in. Once in, they must untie an underwater gate & drag a chest to the beach. Then the chest must be slid along a track requiring 3 missing pieces to be lassoed and pulled into place. Bikal wins immunity plus a tarp, camp chairs, and cushions. Ep3 RC/IC: "Cell Block Sea" - Bikal wins. 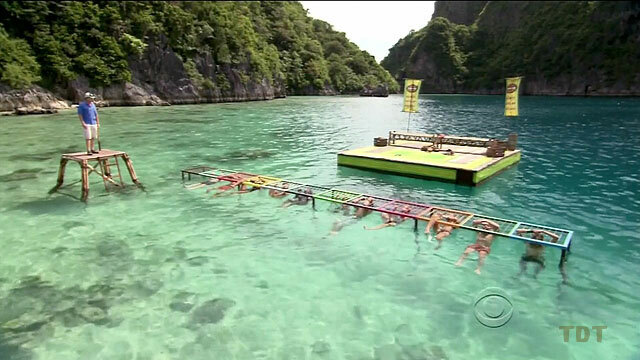 Contestants must untie planks to allow two tribe members to cross three platforms, then all stand atop a final platform (as in Cook Islands). Cochran sits out. Bikal wins a visit from Tata, a local bushman. Shamar removed- early morning on Day 10, due to corneal abrasions. Shamar removed from the game, 16 left. 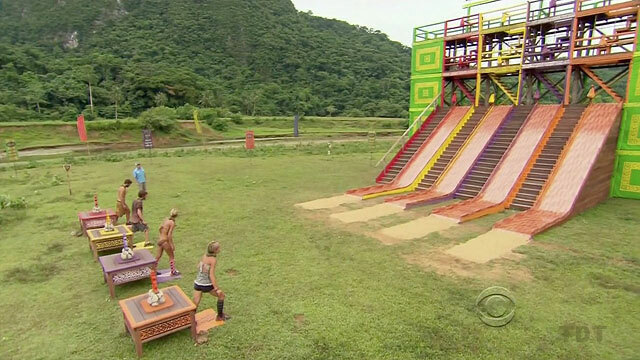 Five contestants from each tribe race out, climb a tower, jump & smash a tile to release a key. 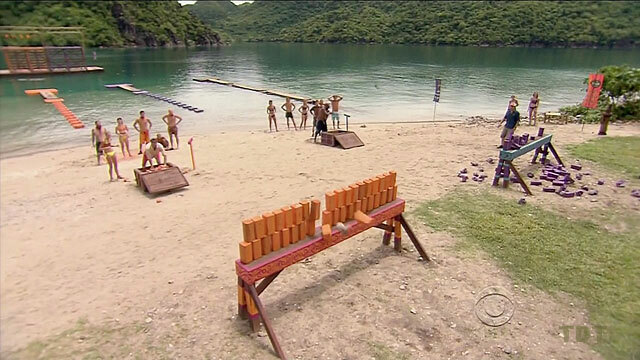 Two other contestants use keys to unlock a chest, which contains sandbags for tossing to knock down a number of wood blocks. Dawn and Corinne sit out. Bikal wins yet again. Ep4 IC: "Smash & Grab" - Bikal wins again. 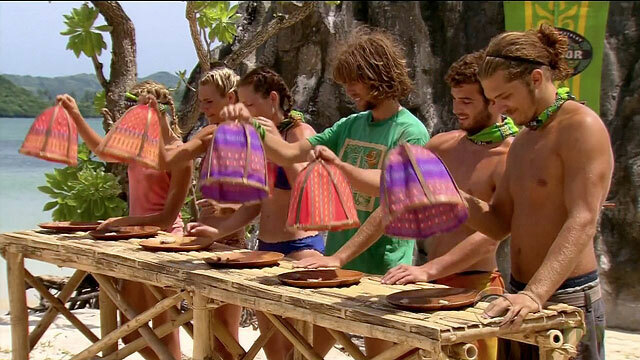 Two contestants from each tribe hold ropes to keep up a basket, while the opposing tribe tries to fill the baskets with coconuts. Phillip is last standing for Bikal, who win steaks. Ep5 RC: "Nut Bucket" - Bikal wins. Reynold finds another idol, apparently mere hours after playing it (i.e. morning of Day 11). Ep5 IC: Unused. 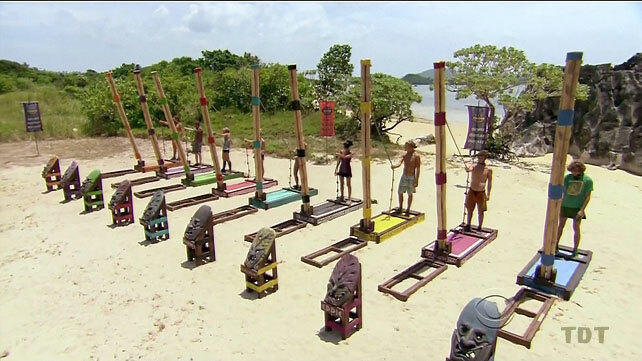 Gota "wins" immunity. TC5 - Brandon "voted out" (8-1), 14 left. Ep6: "Operation Thunder Dome" Ep7: "Tubby Lunchbox" Ep8: "Blindside Time"
Tribal swap. 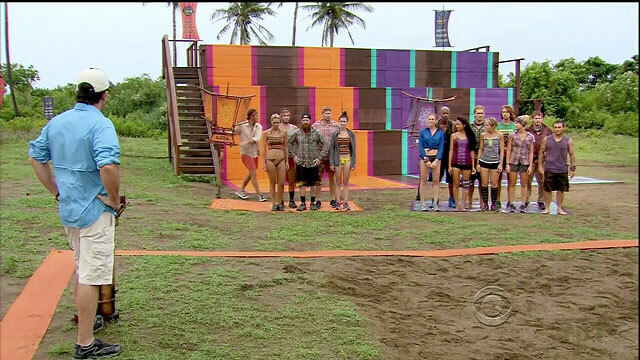 Contestants break paint-filled eggs to reveal new tribes, although fans are forced to only have 1 woman and 2 men on either tribe, thanks to production choices. Well done. Both swapped tribes are given more rice and flint. 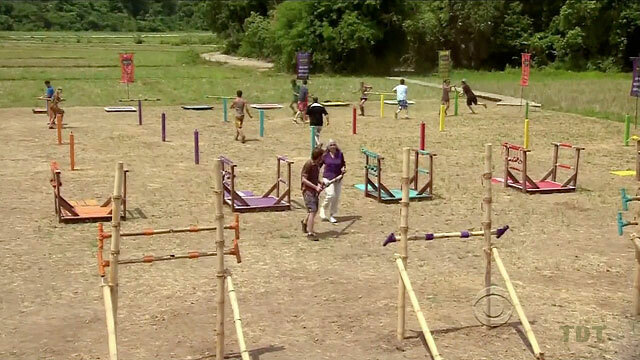 Contestants, in pairs, race out to roll heavy crates back to the start, then assemble a staircase puzzle using the crates. New Gota places all 6 crates quickly, when New Bikal has placed only one. Ep6 IC: "Crate Outdoors" - Gota wins easily. Contestants, clipped together and carrying 20-lb sandbags, race around an oval course, trying to catch other tribe. Brenda sits out, but cheers an easy Gota victory. Gota wins a trip to a 'coffeehouse' with coffee, pastries, cookies and brownies. Ep7 RC: "Hot Pursuit" - Gota wins coffee and pastries. Three contestants paddle out to retrieve a submerged phoenix statue, take it back, put it on a ramp. Another person uses grappling hook to snag five keys, which unlock ramp. Ep7 IC: "Phoenix Rises" - Gota wins again. Tribes merge. "Enil Edam" tribe formed. Ep8: "Blindside Time" Ep9: "Cut Off the Head of the Snake" Ep10: "Zipping Over the Cuckoo's Nest"
Gross Food. First round: beetle larvae, Andrea, Cochran, Malcolm, Eddie, Phillip, Michael advance. Round two: shipworms - Eddie, Cochran, Malcolm advance. Round three: balut, Eddie out. Round four: slice of pig brain, Cochran wins. 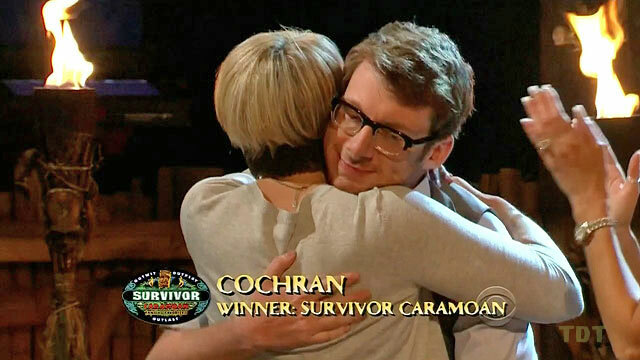 Ep8 IC: "Caramoan Catering" - Cochran wins. After a schoolyard pick, two teams of five - four shooters, one defender. Sherri is not picked, and sits out, no reward. Teams take turns throwing a softball-sized ball past the defender into a fairly large goal. Very few miss. Orange team (Eddie, Reynold, Michael, Erik, Cochran) wins a trip to a waterfall with rappelling and a picnic. 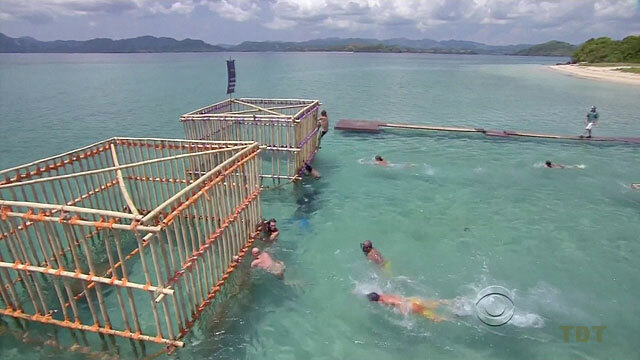 As originally seen in Palau, contestants hold on beneath a metal grate as the tide rises, gradually taking away air space. Brenda is the last to drop out, wins. Ep9 IC: "Last Gasp" - Brenda wins. 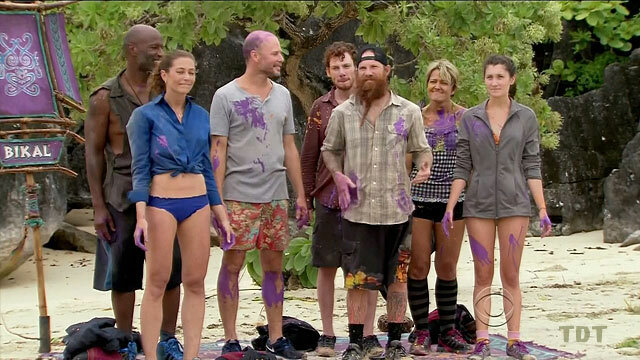 In a repeat of a challenge Malcolm just did in Phillipines, Malcolm still loses, as team cal-purple (Erik, Reynold, Dawn, Cochran, Phillip) wins a spa getaway. Ep10: "Zipping Over the Cuckoo's Nest" Ep11: "Come Over to the Dark Side" Ep12: "The Beginning of the End" Ep13: "Don't Say Anything About My Mom"
Contestants jump off dock, pull themselves underwater to the other side using a rope, then move a ring to a new pole. Two rings in the first round, five in the final round. Phillip opts out of the challenge entirely. Malcolm, Reynold, Andrea, Brenda advance to finals, Reynold wins. Ep10 IC: "Keel Hauling" - Reynold wins. Idols: again. Even though another idol is not normally hidden post-merge if one is still in circulation, Malcolm finds one just when he needs it. Magic. Cochran buys an IC advantage. Malcolm buys a 60-second peek at a clue to a hidden idol location. Andrea gives up a dinner for rice and beans for the tribe. 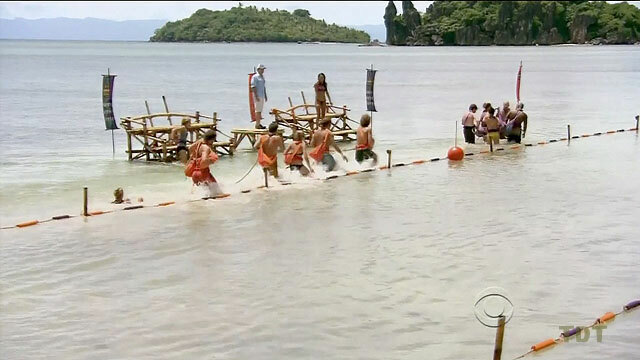 As in the Samoa auction episode, contestants use a rope to hold up a log weighing 30% of their initial body weight. Every 5 minutes, they move one knot down the rope, lowering the log. Cochran's auction-bought advantage allows him to move back up two knots at any point. Cochran wins. Ep11 IC: "Drop A Log" - Cochran wins. TC11 - Malcolm voted out (3-3-3 [6-0]), 8 left. 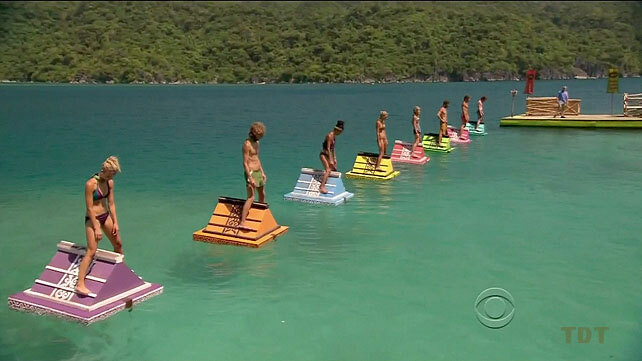 Contestants stand on individual floating triangular platforms. At 15-minute intervals, they move higher up the structure. Erik & Eddie drop out immediately for donuts. Cochran drops at 15 min for hot dogs. Dawn, Sherri, Reynold fall off at 30 min. After three hours, Brenda & Andrea switch to one foot, Brenda falls. 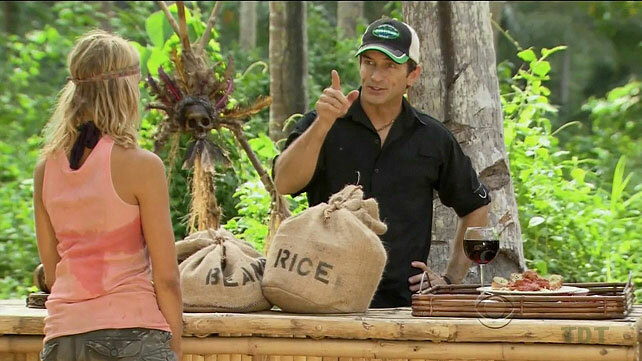 Andrea wins immunity to Hidden Idol clue. Ep12 RC/IC: "Bermuda Triangle" - Andrea wins. "Hidden idols again (afternoon of day 31). Using the clue Andrea won at the RC, Erik finds the hidden idol. He promptly gives it to Andrea. Erik finds idol, gives it to Andrea. 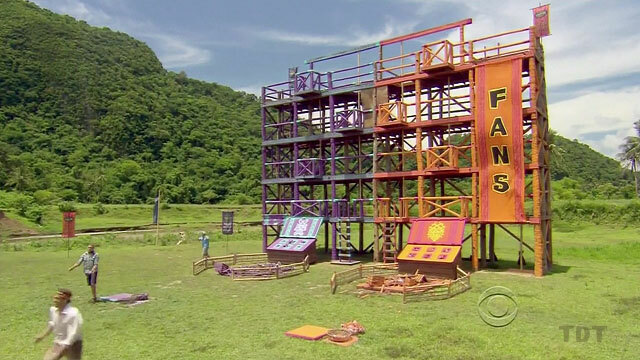 Contestants must pull a float along a rope obstacle course, then untie some keys, which unlock a ladder puzzle. They must then complete the ladder puzzle, in order, then climb up to release a flag. Erik wins. Ep12 IC2: "Fun Climb" - Erik wins. Erik climbs a tree, and a good time is had by all. Contestants plus loved ones must spin three bars around and put them on a rack. Then the pair takes turns trying to land three bolos on the bars. Brenda and her dad, Raymond, win. Brenda picks Dawn & her husband, Dave, to accompany her on a barge barbecue. Probst offers Brenda the choice of picking one more contestant plus the second loved ones, or giving up her (and Dawn's) rewards for the four contestants not shown. Brenda gives up the reward. 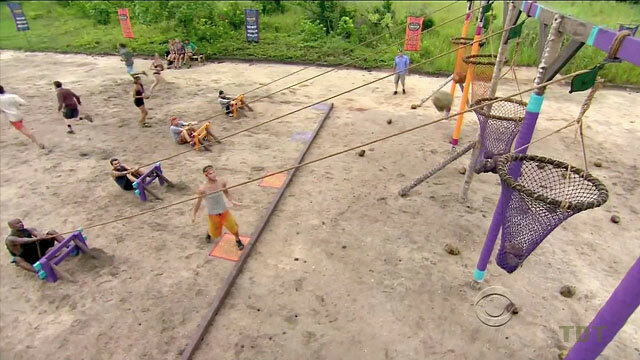 As in One World, contestants hold on to a tow rope that Probst extends in 15-min intervals. Cochran is out first, then Eddie, Erik, Sherri. Brenda drops out after 25 minutes, but later says she jumped. Dawn wins. Ep13 IC: "I Hold On" - Dawn wins. Medevac, night 36. Immediately following Brenda's vote-out, Erik collapses, and is removed for 'starvation symptoms' which is actually mostly an infection in his leg. As in South Pacific, contestants must build a tower of cards on top of a balance, while holding up the balance with one arm. Cochran eventually wins, getting advantage in the IC. Contestants must race up a structure, untie a puzzle bag, take it back, for each of 3 floors. Cochran's advantage lets him skip untying the knots holding the bags. Once 3 bags are retrieved, contestants do a vertical fire puzzle. Cochran wins. Ep14 F4 IC: "Vertically Challenged" - Cochran wins. Final tribal council and jury vote: Cochran wins unanimously, 8-0-0 over Dawn and Sherri.